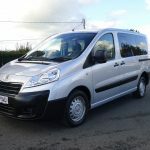 A Peugeot Expert converted by Allied Mobility and adapted with a lowered floor which is a long length at 194cm so if you require extra space this vehicle could be just right for you. 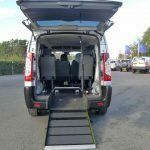 Access is gained via the one-piece, lightweight, non-slip ramp in the rear and for anyone who struggles to push a wheelchair up any inclines, this vehicle has been fitted with a winch. 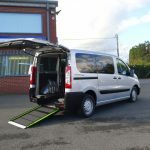 The winch provides a method of pulling a wheelchair up and into the vehicle without any effort which is particularly useful to have when there is a heavier wheelchair required or circumstances dictate. 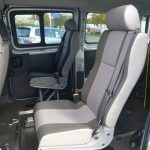 Once on board, the wheelchair restraints ensure that the wheelchair is fastened securely in position and then the safety belts ensure that the wheelchair user is safe and sound before setting off on any journeys. 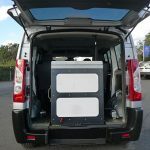 For extra privacy in the back this vehicle has blackout windows if this is your preference. 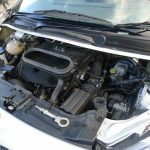 To keep all occupants nice and cool on those warmer days or longer trips, air conditioning is also a feature – always great to have. 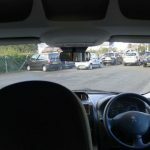 The front of the vehicle, above the driver/passenger area, there is an overhead storage shelf – perfect for keeping any valuables out of sight and keeping the inside of the car neat and tidy. 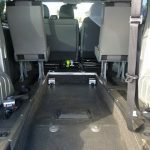 The rear seat too can act as a useful place to carry any essentials required by the wheelchair user or, of course, for that additional passenger. 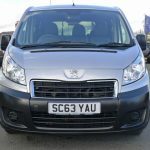 A versatile vehicle with excellent all round visibility. 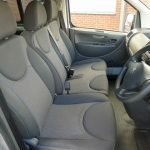 This WAV has an automatic gearbox and a 2 litre diesel engine so the driver can expect to have plenty of power for getting around with. 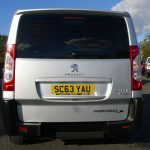 An easy vehicle to drive with the addition of parking sensors too – a great aid if you need to manoeuvre in some awkward areas. 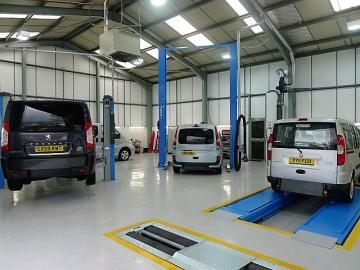 All of our quality vehicles come with 12 months MOT, 12 months warranty and are serviced/valeted in our very own state-of-the-art Service Department.